Some of the most exciting times of pregnancy are those moments (few and far between) when you get to see your unborn child up there on the ultrasound screen, in all their fuzzy glory. Wouldn’t it be great to be able to feel that connection whenever you wanted to? Now, as they say in the classics – “there’s an app for that!”. Despite the nausea and exhaustion, despite the little kicks and the constant heartburn, sometimes it can feel a bit difficult to connect with the little person inside you, and lots of women would say it’s even harder for dads, who don’t have much physical experience of the baby until he or she is born. 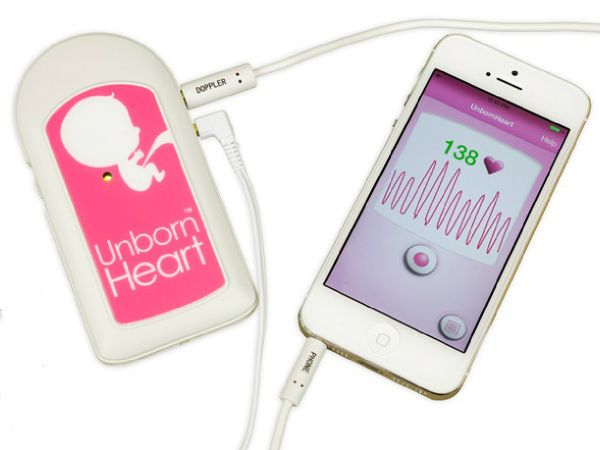 One way to change all that could be with the Unborn Heart Fetal Doppler, which means information about your baby is only as far away as your phone. Approved by Australia’s Therapeutic Goods Administration for home use, this new fetal doppler monitor from Unborn Heart Australia, together with its free app for your phone or iPad, lets you keep track of what’s going on with your baby, before you meet them face to face. It goes without saying that no app will replace regular and high quality medical care, but the Unborn Heart Fetal Doppler can provide a bit of reassurance, as well as the fun of watching your little peanut’s vital statistics and being able to share them. The app will monitor and track your baby’s heartbeat and even keep track of it over time for you if you want to keep statistics. You can record and share the sounds with family and friends too. The Unborn Heart Fetal Doppler costs $139.95 and can be bought online directly from Unborn Heart Australia. The doppler comes with a one year warranty, and purchase enables you to download the free app for iPhone, iPad and Android devices.